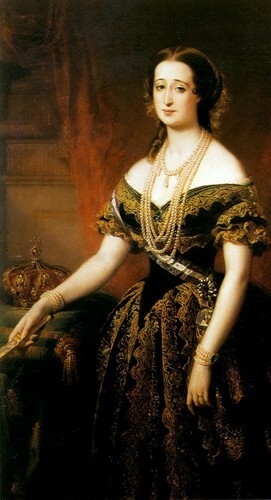 Empress Eugenie দ্বারা Edouard Louis Dubufe. Doña María Eugenia Ignacia Augustina de Palafox-Portocarrero de Guzmán y Kirkpatrick, অথবা better known as Eugénie de Montijo, was the Spanish born Empress to Napoleon III of France.. HD Wallpaper and background images in the ইতিহাসের রাজা-রানী club tagged: photo empress eugenie napoleon iii eugénie de montijo france monarchs royalty. This ইতিহাসের রাজা-রানী photo might contain polonaise, ডিনার পোষাক, ডিনার গাউন, প্রথাগত, সন্ধ্যায় গাউন, পোষাক, and পুরূতপনা.